Up-to-date business-critical data inventories form the backbone of each and every enterprise. Online storage solutions from Fujitsu and NetApp protect this data from loss and store it in a most cost-effective way. Infinite Solutions is NetApp’s GOLD PARTNER and as such can provide Storage from the overall Netapp’s products line, as well as support for them. Fujitsu’s ETERNUS Storage Systems are other disk storage systems that are the most reliable and secure, from online backup to mission-critical applications. Infinite Solutions is Fujitsu’s Corporate Partner. NetApp storage systems offer IT efficiency, business agility, high application uptime, and simplified data management. From Unified Storage Solutions and High Performance SAN Storage to Enterprise All-Flash Storage, Netapp has it all. Whatever the size of your enterprise, you need powerful, flexible storage that manages growth while maximizing the long-term value of your IT investment. The NetApp FAS series simplifies storage operations and connection to the cloud. Its unified architecture supports a broader set of SAN and NAS workloads – faster than any other hybrid array. Reduce IT operational costs by deploying a single unit or a complete cluster faster with System Setup. Automate storage management (provision, protect, monitor) with the click of a button. Choose Netapp and deliver nondisruptive operations and greater than 99.999% availability. 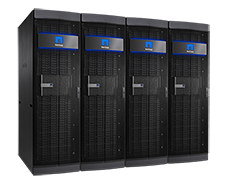 Netapp E-Series are designed to improve operational efficiency, reduce data center footprint, and maintain high availability. The performance-efficient NetApp E-Series storage systems meet demanding performance and capacity requirements without sacrificing simplicity and efficiency. The E-Series are equally adept at supporting high-IOPS mixed workloads and databases, high-performance file systems, and bandwidth-intensive streaming applications. NetApp’s Dynamic Disk Pools (DDP) simplifies traditional RAID management by distributing data parity information and spare capacity across a pool of drives. Massive bandwidth performance, high IOPS, and extreme density support data-intensive solutions are some of their the key points. More performance? Choose NetApp’s All-Flash FAS. It delivers the extreme performance, reliability, and availability to drive greater speed and responsiveness from the applications controlling your key business operations. Increase the speed of business with submillisecond response times, eliminate over-provisioning and improve IT efficiency, achieve the transactional performance of 1,000 15K RPM drives—in a 2U enclosure requiring just 5% of the rack space, power, and cooling. 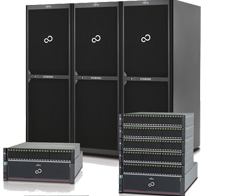 Combining leading performance architecture with automated quality of service management the Fujitsu Storage ETERNUS DX series aligns storage resources with business priorities, thus enabling higher system utilization and delivering increased system consolidation capabilities and a faster ROI. Unified scalable entry-level and midrange systems, a seamless family concept enabling system upgrades and ETERNUS SF, the unified management suite across the product line, reduce operational and migration costs. ETERNUS SF provides enterprise-class functionalities in the entry and midrange class and allows flexible disaster recovery and business continuity concepts for the different model sizes, thus decreasing investment costs. Another topic is about radically simplifying IT infrastructures for data protection comprising backup and archiving. Simplification is achieved by the appliance approach of the ETERNUS CS products accelerating deployment time and reducing maintenance and operational effort. For traditional backup concepts we offer ETERNUS LT tape libraries. Fujitsu’s own technologies and comprehensive service offerings are complemented with products from leading storage technology partners to enable customers to build and operate Dynamic Infrastructures for data management and protection.